Mola Mbua Ndoko: Wisdom and Ways of the Bakweri People: 300. Mokpwe names of days of the week. There are Mokpwe names for, Tuesday, Wednesday,Thursday and Friday. Liwo = a market at a beach or in a seaside village, eg. Liwo la Tiko, Liwo la Mesellele, Liwo la Teni (that is Liyengu MbokeMarket, (New Town Victoria), Liwo la Vatoke. Eluwa = a market in the hinterland,eg. Eluwa Muea, Eluwa Soffo, Eluwa Buea. Mwa = a hoe; plural Meeya. Names of Days of the Week. Tuesday = Liwo londo. Literally, the market is moving southwards/downwards. The formal Tiko Market Day is Wednesday. Many, many years ago Bakweri womencarrying baskets of coco yams on their backs or on their heads trekked down to Tiko on Tuesdays to exchange their cocoyams for fish on Wednesdays. The trek southwards to Tiko was named Liwondo Londo. Thursday = Eluwa Muea. Literally, the market in which “meeya” (hoes) are sold. Muea Market Day subsequently becameknown as Eluwa Muea. Itwill be recalled that hundreds ofyears ago the village of Muea wasrenowned for the manufacture and sale of hoes and farm tools. The name Mueais derived from the word “meeya”. Mesango = litigations. Fridayswere reserved for settling claims at Traditional Village Courts. Fridays then became known as “Mesango”. Satirday = Sateli, derived from theEnglish word Saturday. Sunday = Soondi, derived from the English word Sunday. Monday = Monde, derivedfrom the English word Monday. Oma nanu. 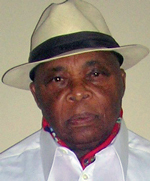 Thomas Mbua Ndoko.